Home » woodworking » On tool trays. Last weekend some friends stopped by, and while in the garage I had mentioned the possibility of building a new workbench. I’m not going to bore anybody with this topic, as it has been beaten to death many times over, but I will bore you with another topic that has also been beaten to death many times over: the workbench tool tray. The tool tray is polarizing among woodworkers, which I find utterly stupid on many levels. Nonetheless, there are often strong opinions when it comes to having one on your workbench. Since I’ve installed a tool tray on my bench it has never gotten in the way of my work, and it has never gotten messy, at least nowhere near the levels that some woodworkers claimed it would. At the same time I’ve never really felt that I’ve used it to the point where it became a necessity. For me, it is an attachment that I use because it’s there, but could live without if it wasn’t….that is until I actually watched the woodworking videos I’ve been filming lately. In those videos, it’s plain to see that several times I am (subconsciously) retrieving an item from the tray, and then putting it back into the tray when I’m finished using it to keep it clear of the work. And that I feel is the tool tray’s greatest merit: its ability to store often-used items at arm’s length without those items interfering with what is happening on the work bench top. So what am I saying that I haven’t said a half-dozen times before? Well, if I were to build a new workbench, I would not include a tool tray. Say what!?! I have one problem with tool trays: to have one that is functional, meaning deep enough to hold an item such as a bench plane without it sticking out, you either need a correspondingly thick bench top, or you need to have some clever engineering built into the bench. In order for the tray on my current bench to be 3 ½” inches deep, which I find is deep enough to keep the vast majority of woodworking tools “below the horizon”, I had to make supports, use wedges, and basically go through a lot of hassle to get it installed correctly. I wouldn’t go through that again, in particular after I’ve finally installed the wall mounted tool racks and shelf unit on each side of my bench. Of course there are other ways of making and installing a deeper tray, such as a mounting it in the center of the bench, but they also require more engineering than I am willing to put into making a workbench, and a center tray also mandates that you have a wider benchtop (at least that is how I would do it on my bench) to allow more usable work space at the front of the bench. Once again, there are ways around that as well, but in my opinion a workbench should be built as simply as possible. As I’ve said before, this topic is pretty much a dead one on many levels. At the risk of sounding ludicrous, I found my own thought process interesting. I’ve been an advocate of tool trays since I began woodworking, yet in an attempt to “front only the essentials…” I’ve discovered that the more “Spartan-like” my work area is, the more I enjoy being there. Maybe, just maybe, I have the makings of a minimalist after all. By billlattpa in woodworking on May 28, 2016 . 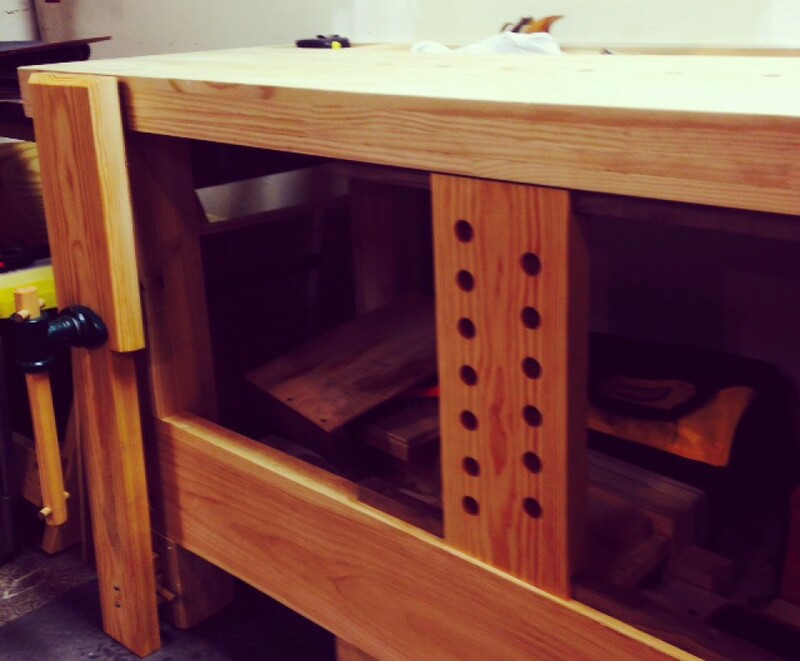 My Paul Sellers’ style bench, which I used for several years until recently, had a tool tray. I used it and it was OK, but, like you pointed out above, it was not deep enough. As a result I ended up moving things out of the way quite often. Most tools ended up of the far end of the bench, Which is also how Paul tends to work. The new bench has no tool well and I haven’t given it a second thought until you posted this. My tools still end up piled at one end of the bench. I don’t miss the tool well at all. What I really want is a small rolling cart with a shallow tray top. I could keep all of the tools that I’m using for a specific task in the tray and the bench would always be clear. Since I’ve gotten my tools on the wall the tool trays have basically been used for the strop, the wonder dog, and my jack plane. I also keep a few screw drivers in there etc, but it’s nothing that couldn’t go on the wall if need be. At the same time, the tool trays have never gotten in the way or been a detriment of any kind. I simply think they can make workbench construction more difficult than need be. I wouldn’t go through the trouble of adding one to a new workbench because I don’t think they’re worth all the added effort. I’ve found a moveable tray useful. More of a tool tote than a tray, maybe 16″ by 8″ by 2 1/2. It holds all the things that can get lost under shavings; pencils, rules, marking knife, chisels, anything that I use all the time, but also put down and pick up frequently. and I can push it out of the way when I need to. The bigger stuff, like bench planes I don’t worry about and they tend to line up at the end of the bench. I’ve seen a tray that clips on the back of the bench, for lack of a better term, and then is removed. If my bench weren’t up against the wall it would be a perfect solution. I’ve been storing my bench planes on a shelf above the bench which I really like. Since I’ve put in the wall racks I’ve found far less need for the tool tray. Having everything visible and within arms reach has been a big plus, and while my tray is hardly getting in the way, I would not go through the trouble of installing one on a new bench. I don’t care for tool trays, myself. I don’t have a problem with them, I just don’t want one. Not having it forces me to clear off my bench when I need to (which is frequently), and I like a clear bench. I don’t mind the tool tray at all. For instance, if I were somebody looking to purchase a workbench (say from Lie Nielsen) and the bench had a tool tray that wouldn’t stop me from buying it. However, being that my next bench, if there is a next bench, would be made by me, I wouldn’t go through the effort again of adding a tool tray. Not that adding a tool tray is an engineering nightmare, but because I have wall mounted racks on each side of my bench I wouldn’t go through the added trouble of attaching a tool tray to a new bench because I now have much less of a need for it.